A new version is out and can be downloaded here. It brings more than only bugfixes but also 25 new wagons and locos, a new station building and a new ship. Some economic data have changed a little bit. 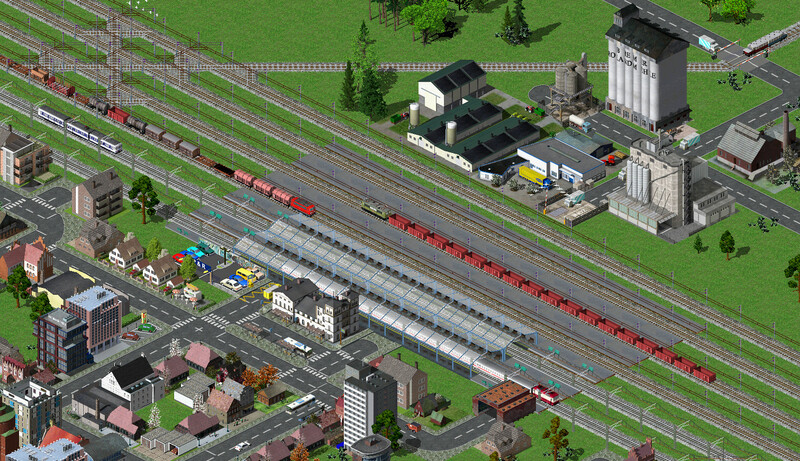 The screenshot shows the new station and several new locos and wagons. I noticed some new locos in the war and post-war period and lots of modern cargo rail cars. Will you also provide an English version of changelog parts KORREKTUREN:, ÄNDERUNGEN:, for they sound interesting? Is VT133 a stand-alone vehicle? Is BR60 able to connect with double-decker cars only? VT133 has low power, I think it´s not recommended to allow attach wagons. Three streamlining BR60 were build especially for the "Lübeck-Büchener-Eisenbahn". And mostly they were coupled with this double-deck-wagons. The wagons in later years also coupled with other locos, but I have planned it for use as "railcar". If you want to continue a savegame that was created or continued with version 0.9 or earlier please notice, that chemical plants now need oil and Kalisalz (potash). This is not mentioned in the changelog as it was planned to only effect new chemical plants but unfortunately it effects even the existing ones. chemical plants now need oil and Kalisalz (potash). May be now chemical plants could supply fertilizer? It could be used to boost beetroot plantation. However now this plantation supplies more beetroots than sugar factories need, for only marzipan and bakery suppliers need some sugar. So beetroot farm base production number should be turned down first. One day this will surely be added. On the other hand it makes industry chains more complicated. Some players might not like that. We are going to have more farms so we may differ between standard and biological farming where standard needs chemical fertilizer.